Hard to say when's a good time to watch this one, but don't rent it with the kids or a date. Worth seeing just for the deeply-felt performances, even if they aren't deeply realized. 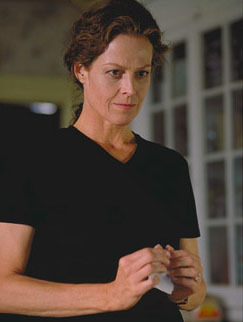 "Map of the World" is a slice-of-life tale of emotional anguish that gives the capable, wonderful Sigourney Weaver her first truly challenging role in ages. As a once unflappable rural wife facing overwhelming calamity when a neighbor's daughter drowns in her backyard pond, Weaver offers up an oddly droll but moving depiction of the pressures and joys of ordinary motherhood, fallen under a very dark cloud. Riddled with guilt and self-loathing, Alice (Weaver) retires to bed for days at a time. She neglects her own two girls and leaves managing the household to her neglectful but hard-working, farmer husband (David Strathairn). Then, as if she's being tested on a Biblical scale, misfortune strikes again: A temperamental child at the elementary school where she's a nurse invents misguided charges of molestation against her. So on top of Alice's anguish, she now finds herself in jail with the dregs of Racine, Wisconsin, and on trial for a crime so heinous she can't even imagine how the boy could come up with such a story. Based on a novel by Jane Hamilton and directed by stage vet Scott Elliott, "Map" is deeply affecting and smartly acted by Weaver, Strathairn and the veritable Julianne Moore. Moore plays the neighbor, who can't face Alice after the death of her little girl but still sticks by her, helping Strathairn around the house and, although it's painful for her, being a surrogate mother to Alice's children while she's in the slammer. Moore becomes the only friend the family has left in this persnickety small town. A simple, spare film, sprinkled with ironic humor in spite of its heavy air, "Map" has the ring of authenticity about it -- from Weaver's visible frustration with Moore's spotless housekeeping to the opening scene that finds her fetching morning milk from the barn in mud boots, pajama bottoms and a flannel shirt. But while the characters are so natural and human that quirks which might define them in lesser movies are here simply snippets of these people's personalities, "Map" remains disappointingly unengaging. I would liked to have recommended this movie because it is a significant study in subtlety and emotional constitution. But even with its ardent performances and genuine poignancy, "Map" inspired little more than a shrug from me.